On Thursday 4th October, a Thanksgiving Mass was held for Patrick Sandeman at the Church of the Immaculate Conception, Farm Street. The last seat in this huge church was taken twenty minutes before the service began, a testament to the wide regard and affection in which Patrick was held. As Jancis Robinson put it on the day, the fact that only about a fifth of the congregation had any connection to the wine trade showed he ‘had a life’. You can read Jancis’ full report on her site JancisRobinson.com. The whole of Lea & Sandeman was closed for the day and all the current team, accompanied by a good many ‘old boys’ attended the service. To you all at L&S, I knew Patrick on and off over the last 15 years. The last time I saw him was outside Chateau Pontet Canet, when he was visiting Bordeaux with The Vintners Company. As a fellow Vintner, I knew some of the Vintners gathered there, but Patrick made sure I was introduced to every one of them individually and then we discussed the 2011 Bordeaux. 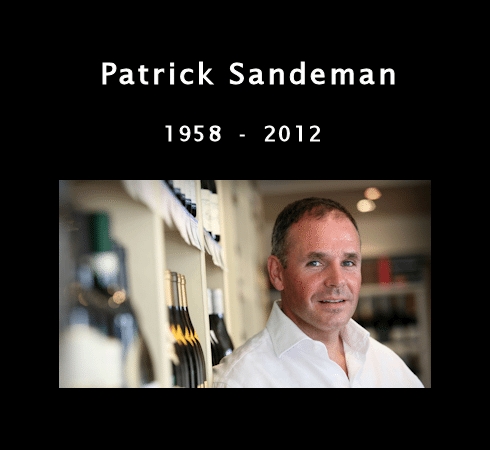 He was then and always was, when I saw him, a true gent and one of the finest ambassadors for the wine trade and especially L&S. I will miss him, the trade will miss him, but of course you guys will miss him the most. My thoughts and prayers are with you at this most difficult of times. – Paddy Magill.